A traditional recipe, one of the many traditional recipes for cooking anchovies with pasta. Very tasty, easy to do and with strong flavour. Notes to recipe: anchovies spaghetti are a traditional recipe whose sauce can be made whether with tomatoes or not. Here we propose the variant with fresh tomatoes. 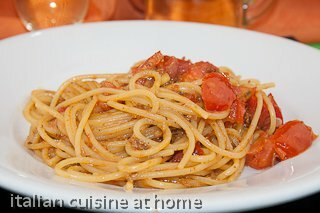 Anchovies spaghetti recipe is made with salted anchovies.